I absolutely LOVE my medicine bag and gorgeous crystal! I loved it so much that I also purchased one for a friend. I will be purchasing many more! I received my April bag and to tell you I am excited would be an under-statement. It was the best so far!!! I love the green and the little heart on the front of the bag, but the Necklace with the picture inside was what made me cry. It was so me. So beautiful and Aly has the best spirit ever. I love this bag and ALY. I will continue as long as I have breath in my body. So wonderful to feel like a bag is just for you. I told her about things and so far I have recieved a few bags that feel catered to me. She is totally amazing. Everything is handmade and it is gorgeous. Hi Kim. I see on your account that you signed up on December 6th. We've exchanged emails a few times communicating about your desire to receive a specific, previous months bundle earlier than your first shipment date which is January 5th. Im always happy to help get you a bundle that your Spirit is feeling called to and we talked about doing so. I'm sorry you're frustrated it didn't come sooner but I communicate multiple times that the normal shipment date wasn't for some weeks and the holidays might keep me busy. I'm glad we've corresponded through email yesterday to come to a good conclusion about your subscription. For future reference, its good to take notice of when your bundle is supposed to ship out. Blessings & Best Wishes. Love the stone and bag thank you. I love my Spirit bag! 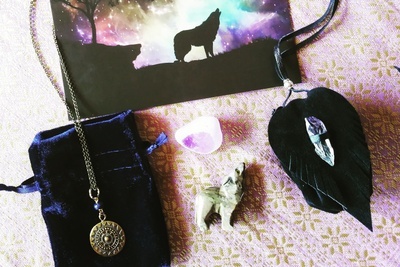 I was delighted with the spirit bag and stone and surprised with the beautiful necklace that was included and delicate shell for meditation! I am looking forward to next month’s Una Spirit Bag! Thank you! Absolutely loved my first pouch! The little crystal & feather adornment could not have been more perfect. Alicia’s love and commitment is evident in her attention to detail and the overall beauty of the pouch. The pouch exudes the spirit with which it was made! Hoping to upgrade next month to the Medicine Bundle! Thank you, Alicia. I get excited every month when I see their return address on the package!